(vi) Assist the Panel of expert in conducting the third party monitoring. To lend support to preserving the Langtang National Park environment from outside population influx and other negative impacts in the project VDCs that include National park Buffer Zone areas (principally Helambu VDC and parts of Ichok and Kiul VDCs. 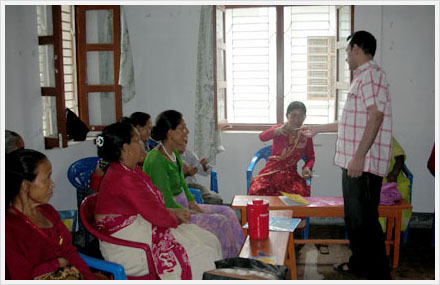 To develop a SUP Health Plan for improving and upgrading existing health facilities and general health care in the Melamchi Valley, through the training of health personnel and the supply of basic medicines and equipment to local health service programs including construction of physical infrastructure. To assist in the development and upgrading of Melamchi Valley education through support to schools, including the building or upgrading of physical facilities, implementation of school sanitation programs, training of teachers, provision of grants and scholarships, and implementation of adult literacy programs including supply of basic education materials. Income Generation/Community Development – to provide guidance and funding to promote income generation and community development activities through capacity building at the local level, under the pre-existing Local Governance Program (LGP), includes formation of COs and CMCs, seed grant capital, to form savings and credit groups, agriculture and livestock development programs etc. Assist with the formation and institutionalization of HSMVSUPIC and any similar local committees. AEnhance the capacity of HSMVSUPIC executive committee and secretariat to plan, execute manage and monitor social and environmental development program and resettlement action plans from ADB loan funds. AUpdate and improve the SUP implementation guidelines and implementation systems of social uplift program under the subproject. AReview and confirm the criteria for eligibility of affected people to benefit from the subproject and the criteria for the sub-component selection to ensure consistency and compliance with ADB safeguards requirements. AReview and confirm the criteria for the sub-component selection to ensure consistency and compliance with ADB safeguards requirements. And assist the Safeguards Unit and HSMVSUPIC in screening proposals in accordance with the said criteria. AAssist HSMVSUPIC and PMU in preparing annual budget which identifies SUP sub-components to be undertaken for the applicable year. AEstablish a mechanism for public audits at least twice a year. ASupport HSMVSUPIC in implementing the social development support program, and undertake capacity building of HSMVSUPIC through skills development and training. ASupport HSMC in monitoring the progress and performance of the social development support program including compliance with Safeguards requirement. AAssist HSMVSUPIC and MWSDB in preparing policies for eater levy to be paid for water diversion and entering into an agreement between Kathmandy Valley’s authorized agency and Melamchi Valley people regarding the levy to be paid for water diversion.